When I watch television, any time I see an actor or actress who is not aging gracefully, I often shout, “Somebody needs some Advanced Night Repair, stat!” My TV watching companions chuckle good-naturedly when this happens, but I know they’re just being nice. It’s happens so often, the line now undoubtedly falls firmly into the realm of “dad jokes.” The takeaway here is that I’m a long time fan of Estée Lauder Advanced Night Repair. I’ve been using it regularly for three years, which turns out to be plenty long enough for me to work it into a repetitive one-liner. Given my history with Advanced Night Repair, it was only natural that last year, when I discovered Missha Time Revolution Night Repair Science Activator Ampoule, I couldn’t wait to try it. It was the perfect opportunity to compare two of my favorite brands using a product I happen to be very familiar with. Today, I’m finally sharing the results of a Skincare Smackdown that actually began long ago. As always, I like to use most skincare products for a minimum of 28 days before passing my final judgment. For this comparison, I’ve actually had much longer to evaluate each product – years, in the case of Estée Lauder Advanced Night Repair Serum, and 6 months in the case of Missha Time Revolution Night Repair Science Activator Ampoule. Today, I’ll be judging each of the products based on ingredients, performance, packaging, and price. May the best serum win! Estée Lauder Advanced Night Repair and Missha Night Repair Science Activator are both serums that claim to protect the skin from environmental damage, reduce fine lines, even skin tone, and moisturize. They are designed to be applied after cleansing, before moisturizing. Water\Aqua\EAU, Bifida Ferment Lysate, Methylgluceth-20, PEG-75, Butylene Glycol, Bis-Peg-18 Methyl Ether Dimethyl Silane, Arabidopsis Thaliana Extract, Tripeptide-32, Ethylhexyl Methoxycinnamate, Lactobacillus Ferment, Cola Acuminata (Kola) Extract, Retinyl Palmitate, Pantethine, Caffeine, Glycereth-26, Sodium RNA, Squalane, Oleth-3 Phosphate, Oleth-3, Oleth-5, Bisabolol, Choleth-24, Ceteth-24, Hydrogenated Lecithin, Anthemis Nobilis (Chamomile), Sodium Hyaluronate, Tocopheryl Acetate, Lecithin, Xanthan Gum, TEA-Carbomer, Trisodium EDTA, BHT, Phenoxyethanol, Methylparaben, Benzyl Alcohol, Green 5 (C61570I), Yellow 5 (CI19140), Red 4(CI14700). There are some very good, notable skincare actives in this Estée Lauder serum. In addition to Bifida Ferment Lysate, Advanced Night Repair also contains Lactobacillus Ferment, another probiotic. Lactobacillus ferment acts as a skin softener, and was also shown in one study to be therapeutically effective in the treatment of atopic dermatitis. Also notable is the Retinyl Palmitate, a very gentle form of Vitamin A, and Sodium Hyaluronate, a skin hydrator that can hold 1,000 times its weight in water. I’m intrigued by the inclusion of the ingredient Ethylhexyl Methoxycinnamate, which is actually a sunscreen ingredient. I’m very curious about its inclusion in an evening serum since its pretty universally recommended not to wear sunscreens on your face at night. However, as far as chemical sunscreen agents go, Ethylhexyl Methoxycinnamate is one of the gentlest in the bunch. If I had to guess, I’d say it’s purpose in this serum to stabilize another ingredient. Running this list through COSDNA did return one red flag. The ingredient Oleth-3 scores a big fat 5 out of 5 as a potential acne trigger. Like the Estée Lauder Advanced Night Repair Serum, Missha Time Revolution Science Activator Ampoule also contains Lactobacillus and Sodium Hyaluronate. The Missha serum contains Retinol instead of Retinyl Palmitate – Retinol being the stronger of the two. Additionally, the Missha formula also contains a multitude of beneficial plant extracts, and one of my personal favorite actives, Niacinamide, which has anti-inflammatory and brightening properties. I also noted that the Missha formula does not contain the chemical sunscreen ingredient. When I ran the Missha list through COSDNA, there were no red flags in terms of acne triggers or irritants. I was surprised to find that although the Missha ingredient list is nearly three times longer than the Estée Lauder list, it actually contains no irritants or acne triggers. Winner of this Round: Missha Time Revolution Night Repair Science Activator Ampoule, for having more skincare actives and no irritants or acne triggers. 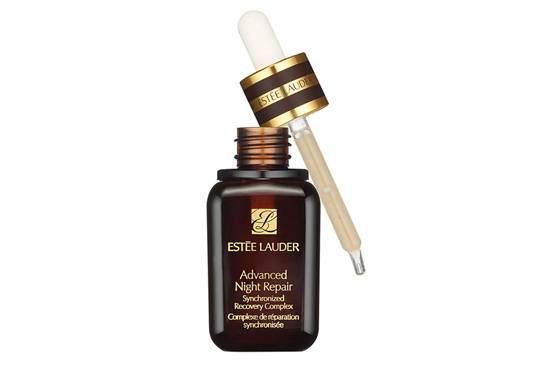 The Estée Lauder Advanced Night Repair bottle has a very serious, medicinal look to it. The brown bottle looks like glass, but it’s actually some sort of very sturdy plastic. It uses a glass dropper for dispensing product, which I like because it’s hygienic and easy to control the amount of product I’m using. The Missha Science Activator Ampoule bottle is a little flashier in terms of its look. I’m personally more attracted to the look of the more serious, brown, Estée Lauder bottle, but that’s purely an aesthetic preference. The bottle itself is made of heavy glass. The Missha serum also uses a glass dropper to dispense the product, but it has an interesting addition – the bottle has a ring around the inner lip of the bottle top that removes excess product from the outside of the dropper as it’s pulled out of the bottle. It’s a nice touch that helps ensure not a drop of this liquid is wasted, and I appreciate it! 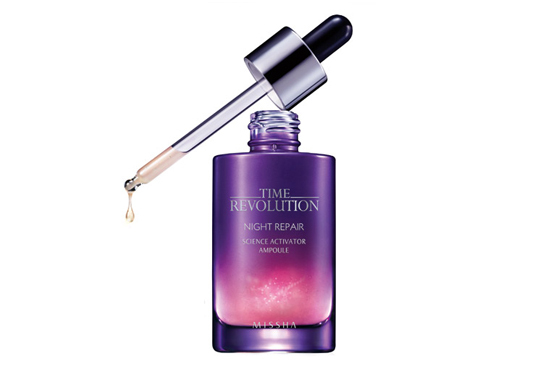 Winner of this Round: Missha Time Revolution Night Repair Science Activator Ampoule, for having a bottle convention that prevents product spillage and waste. I love the texture of this serum. It absorbs quickly, and provides an additional bit of moisture that I enjoy having in my routine. In terms of immediate results, my skin is softer and subtly brighter after using this product – a difference I can see after only a few nights. I’ve also noticed an overall calming effect, a decrease in redness, and a reduction in inflammation around any acne spots I might experience. Over time, there aren’t any mind blowing visual differences – most of this product’s anti-aging function is preventative. I think if there was a magical way to compare my face after 10 years of using this product to my face after not using this product for the same 10 years, I’d be happy with the results. Unfortunately, technology hasn’t advanced much in the magic department, so that’s all speculative. However, I can say that when I stop using Advanced Night Repair (and don’t replace it with a similar serum), my complexion loses a little bit of luster, which is what has kept me loyal to this serum for so long. The Missha Science Activator Ampoule is similar in texture to the Estée Lauder serum. It has a little more slip to it, and though spreading it over my face is a little bit easier, it does take longer to absorb and is slightly stickier. The stickiness becomes irrelevant quickly since it disappears completely once moisturizer is applied, but it’s still worth noting. Like the Estée Lauder serum, my skin is softer and subtly brighter within the first few nights of using this product, with a decrease in redness and a reduction in inflammation. It’s also similar to the Estée Lauder serum in the sense that most of the anti-aging action is preventative, and therefore there’s no way to evaluate it. One area where Missha excels, however, is in the brightening effect, which is slightly more visible with the Missha Ampoule. Winner of this Round: Missha Time Revolution Night Repair Science Activator Ampoule, but only by a smidge, and only because of the more visible brightening effect. In terms of texture, I prefer the Estée Lauder Advanced Night Repair Serum. Advanced Night Repair comes in two sizes year-round – a 30 mL and a 50 mL that retail at $55 and $84, respectively. There is also a special extra large size that’s released a couple of times a year, and usually sells out quickly. That one is 100 mL, and retails for $140. The Missha Ampoule only comes in one size, a 100 mL bottle that retails for $80. It used to be sold in a 50 mL bottle for a lower price, but it seems Missha has switched over to only the 100 mL size for the US market. It is still available in the 50 mL bottle from international sellers. Winner of this Round: Missha Time Revolution Night Repair Science Activator Ampoule, for providing 100 mL of product for less than the price of half the amount of Estée Lauder Advanced Night Repair Serum. 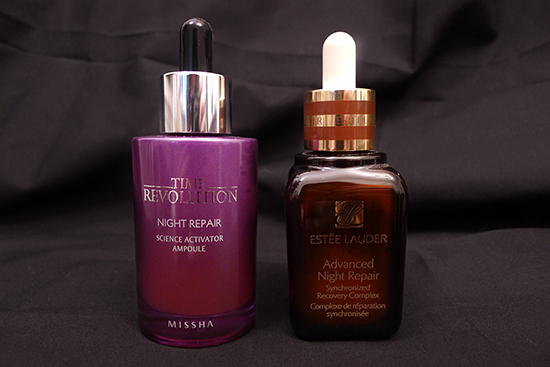 Missha Time Revolution Night Repair Science Activator Ampoule is the winner of this Skincare Smackdown! Don’t get me wrong – I’m still a huge fan of Estée Lauder Advanced Night Repair, and I maintain that the texture and the way the Advanced Night Repair feels immediately upon application is superior. But when it comes down to which product I’ll repurchase from this point on – the superior ingredient list, cleaner packaging, and more visible immediate effects make Missha Science Activator Ampoule the winner. Performance: 4/5 – Brightening, calming, slightly moisturizing. Purported cumulative anti-aging effects. Value: 4/5 – $80 retail for 100 mL (3.4 oz.) of product is a great price for a quality serum. Additionally, it’s frequently on sale on Missha’s US website. Now through Thursday, October 31st, you can use this private link to get a bottle of Missha Time Revolution Night Repair Science Activator Ampoule for 30% off! This means you can pick up the Night Repair Ampoule for $35 instead of $50, so it’s an excellent deal. I usually buy mine from Missha’s US website. Right now, Missha is having their semi-annual sale, so it’s a great time to pick this up! The Missha Science Activator Ampoule is currently on sale for $48, which is 40% off! You can also pick this up from W2Beauty, which carries a 50 mL size not currently available from the Missha US website. This size sells for $52, so if you miss the sale, but aren’t ready to commit to $80 worth of product, W2Beauty is a great option. Nice! !I actually wanted to buy the Missha’s! But..that’s a lot of money involved.. Yes, the price tag is high! But it does feel and look like a luxury item, which makes me feel a little better about the cost. It’s definitely a treat! Misshas Night Repair Ampoule is one of the products I really want to buy in future. I love how you compare those two products and I’m happy that the Missha products seems to be slightly better than the Estée Lauder product, since this would be my product of choice anyways. Thanks for sharing..my mom was actually going to buy Estée Lauder Advanced Night Repair Serum..but I told her to try other products..
Oh, good! I hope she’ll try the Missha, but I think your mom would be happy with either serum. 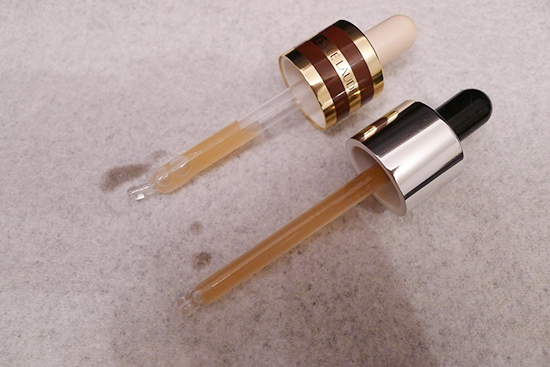 They’re both really nice – the Missha one is just a little bit nicer in the areas that count. Yeah, I feel you on the expensive front. I definitely consider these to be luxury items. And thank you for the comment on my writing style! I sometimes fear being a little overly bogged down in the mire of product details. It’s nice to know you’re not falling asleep at your computer! Yes, they’re both on the pricey side, unfortunately. And there are some really great ones out there that cost less. I’m reviewing one next week that’s fantastic, and in a much more reasonable price range. Maybe that will be the one you’re searching for! I’ve receive one bottle of the Missha one that I won in a contest. Looking foward to see the results that you mentioned. I’d love to know how it works for you after you try it! OMG this stuff is amazing! I can see already my face more firm, doesnt look too tired anymore, the texture has improved and my occasional breakouts healed a lot faster! Great review! I received a sample of the Missha Night Repair with some other Missha products and was curious to see how others liked it long-term. I’d like to buy the full size bottle, but I’m wondering about how long do you think one bottle would last? Thanks so much! Just so you know, the link for 30% off still works! I used it today and I was able to get it for $35 along with another 10% off since it was my first purchase. Thanks so much for the review! I’m so excited to try this out along with The First Essence. How do the ingredients compare with ANR II? As in, the new Advanced Night Repair? Hey Louise! Excellent question. I haven’t had a chance to try the new Advanced Night Repair yet. It’s definitely on my list though, and when I do try it out, I promise there will be a rematch post! I was wondering if I would be able to use the Missha First Treatment serum and Tretinoin at the same time as Missha has Retinol in it? Just started using the Tretinoin and would love to try the Missha serum. Hi Michelle! I personally haven’t had any issues using the Missha Serum with the Tretinoin, even when my skin was at its most sensitive. The amount of retinol in the Missha formula is so comparatively little, I think the likelihood of any problems is quite slim. Thanks! 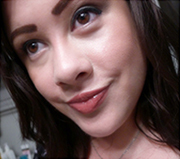 Your site has been such a great help to me in finding a new skincare regimen. The Benton line is the one that I am leaning towards since you make it sound like gold in a bottle for acne prone skin, which I have. I have been using the Benton Aloe BHA toner for more than a month. However, I just bought the Missha Ampoule and tried to use in conjunction to the Benton toner and had a huge allergic reaction on the spot. I developed a weird burning and itchy rash on my face. At first I thought I was it was just my imagination and left it on my face for a few minutes. However as the burning and itchiness intensified, I immediately had to wash it out. So my question is, how you use the Benton Aloe BHA Toner and the Missha Ampoule together? Or am I solely allergic to the Missha one? Since that day, I haven’t used the Missha ampoule because I did not want to experience another weird allergic before an important day—that is my job interviews. I will, however, try the Missha one again. But I am curious whether the use of both products are incompatible with one another. Hi! Is it okay to use the Missha ampoule in the morning even if it has retinol? Are these serums suitable for woman at early twenties? Thanks so much for this review. I’ve been thinking about getting the Missha ampoule and I think I’ll pop out and get it later. I just wanted to mention, though, that you can get it in the smaller packaging online on gmarket (http://item2.gmarket.co.kr/English/detailview/item.aspx?goodscode=392150018). $24 is a much smaller investment than $80 if someone is unsure! Can you recommend a product similar to Missha’s preventative care in this serum? I’ve done some trial and error the product definitely makes me breakout. Its not the retinol as I use a PC retinol and I’m just fine. Help help help! Thanks for sharing, I just purchased mine from Amazon https://www.amazon.com/gp/aw/d/B00ATLVNIS/ref=mp_s_a_1_2?qid=1440479105&sr=8-2&pi=AC_SY200_QL40&keywords=missha+time+revolution&dpPl=1&dpID=41Y0YvtR7uL&ref=plSrch and I’m worried it may not be the real thing since the price is much lower.. Thank you so much for this :)) I saw that there were no acne causing ingredients in the Missha product I was just wondering if there are any harmful ingredients to the skin?